The Double Trouble twin pram is the ideal double/twin pram for twins and siblings on the South African market. Transport your babies in style with this modern, trendy and sophisticated twin pram that together with the use of a car seat adapter and infant car seat can be easily converted to a complete twin travel system. Transport your babies in style with this modern, trendy and sophisticated twin pram that together with the use of a car seat adapter and infant car seat can be easily converted to a complete twin travel system. 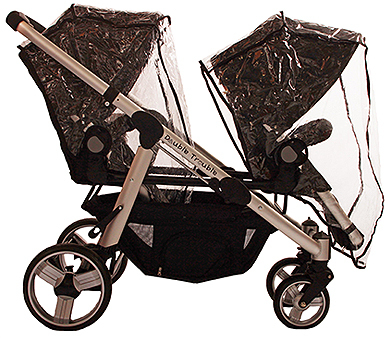 The Double Trouble Twin Pram is one of the lightest twin prams on the market. 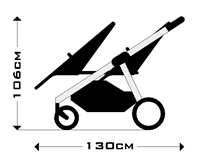 This twin pram has a unique compact design and an ergonomic folding system for easy storage at home or in your car boot. The Double Trouble twin pram operates as a modular travel system that together with the Maxi-Cosi car seats can be used as a twin pram from birth and later as a double stroller for toddlers. 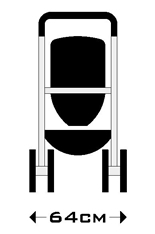 This pram encourages interaction and stimulation by providing various configurations of forward facing and rearward facing seating positions. Children are able to interact with each other, with their parents and with the surrounding environment simply by rotating the positions of the toddler seats. Both toddler seats recline for easy nap times. The unique versatility of this twin pram provides for babies that reach different developmental stages at different rates. The Double Trouble Twin Pram is ideal for siblings as it accommodates toddler seats, carry cots as well as infant car seats. The Double Trouble Twin Pram includes the light weight aluminium frame and two spacious toddler seats with sun canopies, a large shopping basket and adapters for Maxi-Cosi infant car seats. Sturdy and light weight which is easy to steer.